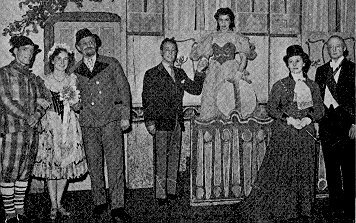 As for 'Bitter Sweet', Noel Coward's musical play, which was performed in February, 1951, the Press referred to it as 'A brilliant spectacle and feast of good music.' Now thoughts were turned to the productions which would commemorate the Golden Jubilee of the Society. To mark the occasion, it was decided to produce two contrasting shows, one to be a Gilbert & Sullivan opera, the other, a new musical comedy. 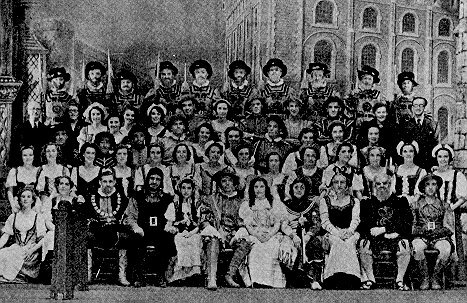 The choice of 'The Yeomen of the Guard', with its essentially English qualities, was thought to be especially fitting for production in Festival of Britain year. 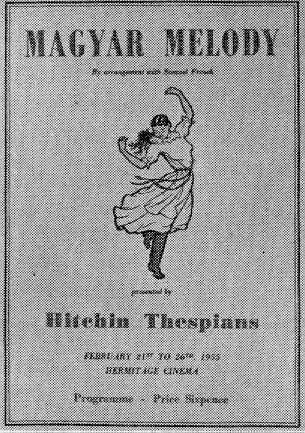 This was performed in October, 1951 - the fifth time that the Thespians had produced the opera. The critic of the 'Hertfordshire Pictorial' was in no doubt about the aptness of the opera or the quality of its production. 'No better choice could have been made by Hitchin Thespians in their jubilee year than Gilbert & Sullivan's 'Yeomen of the Guard', for it was on the work of the famous collaborators that the Thespians made their reputation and 'The Yeomen', the most typically English of all their light operas, was just the thing for this Festival year. The celebration of any jubilee is excuse enough to be nostalgic ... this was a show to be really nostalgic about. There have been many 'Do you remember?' queries among this week's audiences. But apart from the memories it revives this jubilee presentation stands on its own merits as a first-class one'. After the final curtain on Saturday evening came a surprise item - the appearance of Miss Pepper, only surviving member of the original committee and Mr Tom Palmer, a lifemember of the Society, introduced to the audience by the President, Mr W. G. Willmott. 'Of Miss Pepper, whom he presented with a posy,' reported the 'Herts Pictorial,' 'Mr Willmott said it was she who went to the south coast, and after seeing a performance there came back and told Mrs Waiter Carling that Hitchin must have an operatic society. Mrs Carling agreed and the Thespians resulted.' In September, 1952, Mr Willmott announced that he was retiring from the position of President through illness, and Mr R. H. O. Wright was elected to the office in his place. As a result of this change, Mr Wright relinquished the post of Musical Director, which he had held since 1924, and was succeeded by Percy Wells, organist at St. Mary's Church, Hitchin. From its very early days, the Society had been affiliated to the National Operatic and Dramatic Association, and, having now been in existence for fifty years, was given permission to surround the N.O.D.A. emblem with a laurel wreath, which design has been used ever since. In 1953 then, came the first show to be performed under the baton of Percy Wells - 'The New Moon'. It certainly had attraction for the public, for on the Monday night, more money was taken at the box-office than on any first night since the war. 'There is every indication', wrote the Press, 'that the Society's bold step in entrusting the fortunes of 'New Moon' to young local talent (something of a revolution in itself) will be rewarded by success - both artistic and financial.' Financial success there was, for at the end of the week's run, Mr Wright was able to tell the audience that not less than £250 - all the proceeds of the production - would be given to the National Flood and Tempest Distress Fund, which had been opened to help the victims of the disastrous East coast floods earlier in the year. Artistic success there was, too. This was the first appearance for the Thespians of Peter Guthrie, who has since established a unique record in the Society by appearing in a principal role in every show from 'The New Moon' onwards. After 'Wild Violets' came 'Magyar Melody' and, for the first time, the Thespians had an American in the cast, in the person of a tenor from California, Charles 'Chuck' Runnels, a dental clinic Staff-Sergeant then stationed at Chicksands U.S.A.A.F. base, Shefford. 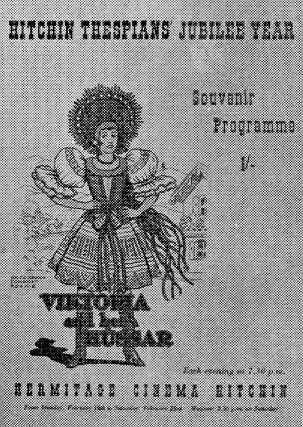 In his speech to the audience after the Saturday evening performance, Mr R. H. O. Wright, the President, announced that the Society had given its last show at the Hermitage Cinema. 'The Thespians have to make way for the march of progress', he said. 'in this case it is cinemascope, which is to be installed in this cinema in two or three months. This is the last occasion on which the feet of the Thespians will tread the floor of the Hermitage ... It will be a great sadness that we have to give up after twenty-four years.